Leatherbacks are known for being among the largest sea turtles on the planet. They can reach up to seven feet in length and grow to be over 2,000 pounds in weight. 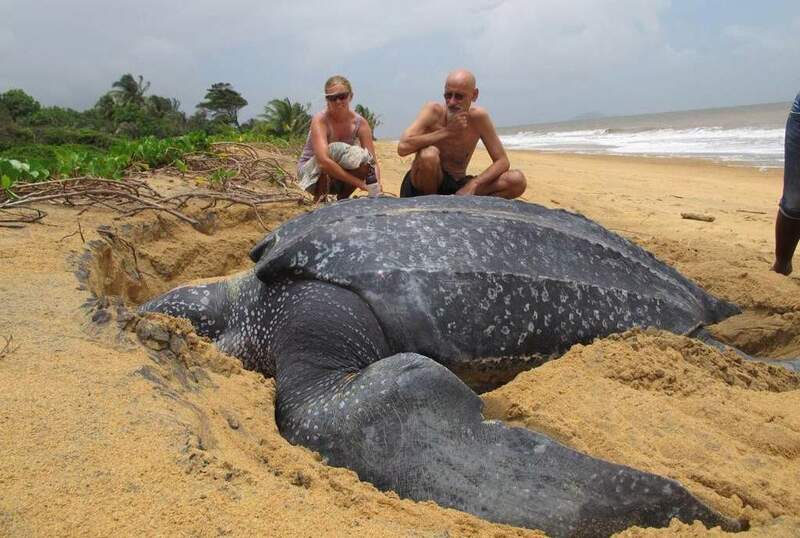 This video shows the amazing moment when a giant leatherback turtle came to shore for a break in the sand. It was filmed at an unknown location. Several tourists looked on with excitement as the massive creature used its flippers to crawl across the beach and make its way towards the ocean. Eventually, after a few attempts and a couple of of pit stops, the sea turtle reached the waves and swam off. Never to be seen again! These types of turtles typically live in the Pacific and Atlantic oceans, near the equator. They are often found swimming off the coast of Central America. The reptiles crawl out of the water during nesting season in order to dig a nest and lay their eggs in the sand near the water. Once the eggs hatch, the baby sea turtle are close enough to make it back into the ocean. The babies take 15 to 50 years to reach maturity and can live for over 100 years!